A FORMER civic leader is calling for local authorities to take immediate practical action as a council sponsored town centre improvement scheme has thrown a major spanner in how the traffic flows around Warminster. "We have to come up with something soon," says former deputy mayor Paul Macdonald. "The diversion away from the town centre is bringing too much conflict between motorists and pedestrians especially school children." The town's secondary school, one of the largest in the county with a huge number of youngsters on its attendance roll, is one side of the town while the majority of the housing is the other side. Added to that the one rat-run through Henford Marsh has been cut off for environmental reasons and a one-way system is in place in the Market Place. The market day on Friday brings yet more activity being particulary popular with the elderly. "I believe the answer is to make all car parking in the town free for the duration of these works," claims Paul. "This would mean that those seeking the the cheapest car parking at the Three Horseshoes Mall and the two hour free parking in the central car park and Weymouth Street could use the Assembly Hall car park instead." "This would reduce the amount of traffic trying to get round Copheap, down Imber Road, along Fairfield Road and into Station Road. "The only safe crossing point along this whole route is the zebra crossing in Imber Road." 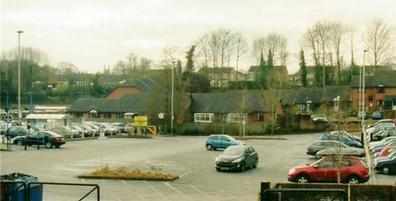 Free car parking by the Avenue School could also have its benefits making up for the loss of spaces along the main roads and stop motorists driving round and round as people including the infirm are trying to reach the surgery claims Paul Macdonald. Paul also hopes that there will be an added bonus for traders as it may encourage those who live to the west of the town who are discouraged by the road works not to head off for Frome. Pictured The western car park mid morning on a busy Friday.